The name of the brown recluse spider is enough to scare most people, let alone the appearance of this unpopular arachnid. Though you hope to never see a brown recluse spider in or around your home, it’s important to recognize them and implement proper pest control measures, just in case. The brown recluse spider lives mainly in the Midwest and Southwest United States. As the name suggests, these spiders are secretive and lurk in hidden places like wood piles, basements, and closets. Anywhere warm, dry, and dark is the perfect home for a brown recluse. You might be able to recognize a brown recluse by a distinct dark brown violin shape on its back. These spiders are only ¼ to ½ inch long, but they do bite, especially when they feel trapped. 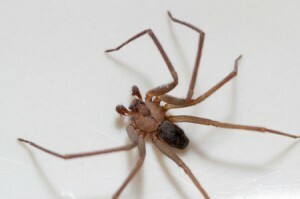 If you put your foot into a shoe hosting a brown recluse spider, or reach your hand into a box where a brown recluse is hiding, you will most likely get bitten. What If You Are Bitten By a Brown Recluse Spider? You probably won’t even feel it if you are felt by a brown recluse spider. However, you are sure to feel the stinging sensation and pain it causes, though your reaction may be delayed as long as eight hours. You’ll know it’s a brown recluse bite if a small blister develops and become swollen. You might experience nausea, restlessness, and fever. Go to the emergency room as soon as you suspect a brown recluse spider has bitten you. One spider is bad enough, but an infestation is enough to send most people running. If you notice webs around your home, or regularly find brown recluse spiders hiding in the dark corners of your home, you likely have an infestation to deal with. There are some steps you can take to safeguard your home from brown recluse spiders, like repairing small holes or openings along the outside of your home and stacking all firewood at least 20 feet from your home. However, it is always best to let a licensed pest control professional apply strategic best control measures. Spider removal takes an experienced eye and practiced patience, so trusti your spider control to a professional from Green Solutions Lawn Care and Pest Solutions. We use environmentally friendly pest control techniques that are proven to eliminate spiders and help you regain control over your environment. Call (813) 684-7336 today to get the customized pest control your home needs. Share the post "Brown Recluse Spiders"